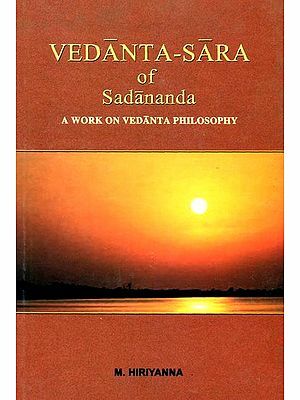 The first ten editions of the present book, Vedanta Philosophy, were published by Udbodhan Office Calcutta. The copyright of the book having been recently made over to us, we take pleasure in bringing out its eleventh edition. 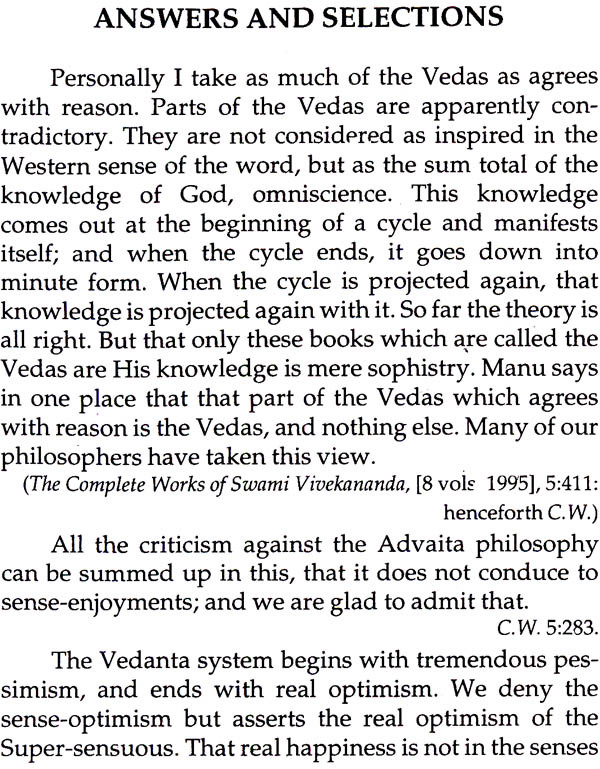 The text have been compared with the original lectures and the passages as they occur in the source book- The Complete Works of Swami Vivekananda. Besides, references to The Complete Works have been printed in the appropriate places to help the readers consult the source-book for further reading. The Harvard Philosophical Club (Harvard University, U.S.A.), where the lecture was delivered by Swamiji in 1896, was in those days 'one of the foremost intellectual bodies in the world,' and Swamiji was also 'at his best' there in the interpretation of his philosophy. It is hoped that the book will continue to be studied allover world by readers interested in philosophy and its appreciation to life and society. The Swami Vivekananda was sent by his friends and co-religionists to present their belief at the Con- gress of Religions that was held in connection with the World's Fair in Chicago. This he did in a way to win general interest and admiration. Since then he has lec- tured on the same theme in different parts of our country. He has been in fact a missionary from India to America. Everywhere he has made warm personal friends; and his expositions of Hindu philosophy have been listened to with delight. It is very pleasant to ob- serve the eager interest with which his own people in India follow his course, and the joy that they take in his success. I have seen a pamphlet filled with speeches made at a large and influential meeting in Calcutta, which was called together to express enthusiastic approval of the manner in which he has fulfilled his mission, and satisfaction at this invasion of the West by oriental thought. This satisfaction is well grounded. We may not be so near to actual conversion as some of these speakers seem to believe; but Vivekananda has created a high degree of interest in himself and his work. There are indeed few departments of study more attractive than the Hindu thought. 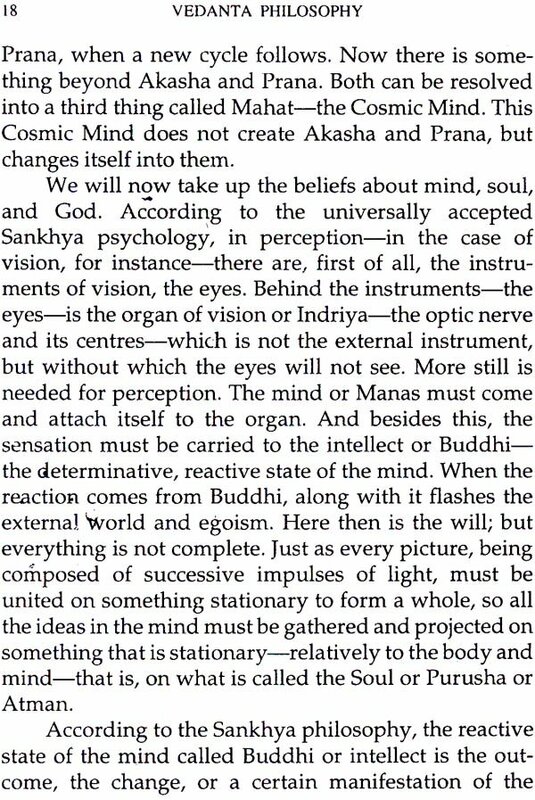 It is a rare pleasure to see a form of belief that to most seems so far away arid unreal as the Vedanta system, represented by an actually living and extremely intelligent believer. This system is not to be regarded merely as curiosity, as a speculative vagary. Hegel said that Spinozism is the necessary beginning of all philosophizing. 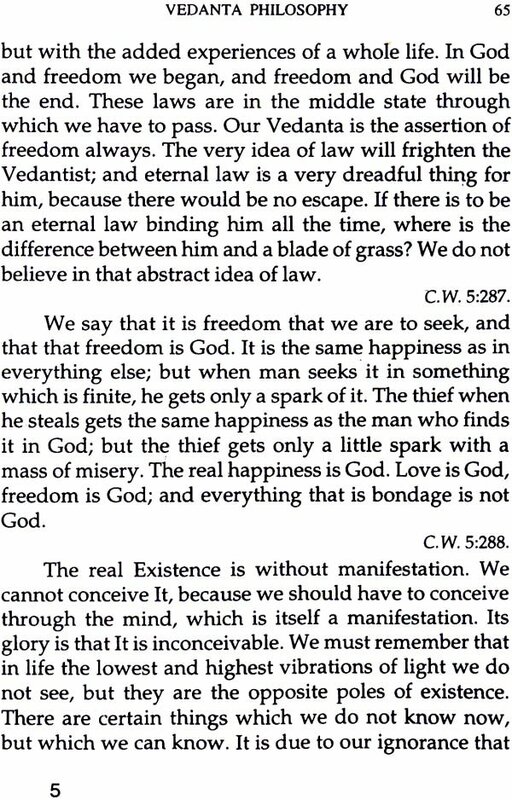 This can be said even more emphatically of the Vedanta system. We occiden- tals busy ourselves with the manifold. We can, how- ever, have no understanding of the manifold, if we have no sense of the One in which the manifold exists. The reality of the One is the truth which the East may well teach us; and we owe a debt of gratitude to Vivekanan- da that he has taught this lesson so effectively.